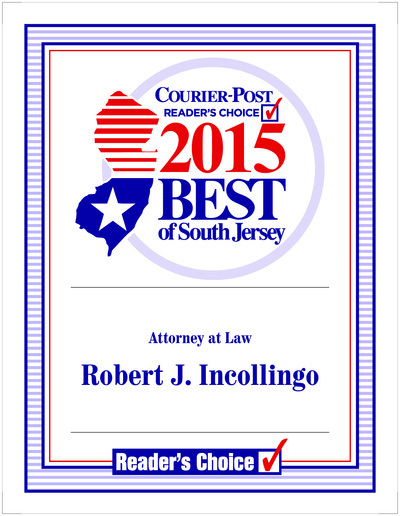 Maria, Laura, Anthony and I join in thanking our friends for voting the Law Office of Robert J. Incollingo Best of South Jersey 2015 – Attorney at Law, in the Courier Post Readers’ Choice poll. This listing is not meant to compare the quality of our services to those of other lawyers, nor is it intended to imply that our firm can necessarily obtain a better result than other counsel. Still, it’s nice to be noticed. The Best of South Jersey list is issued by Courier Post newspaper. A description of the selection methodology can be found at http://courierpost.secondstreetapp.com/l/CourierPosts-Voters-Choice-2015-1/Rules. No aspect of this advertisement has been approved by the Supreme Court of New Jersey.